The Food Gods have gifted me with 2 Tickets to the Houston Press MENU OF MENUS® this Tuesday, April 5th @ Silver Street Studios! EMAIL your FULL NAME & MAILING ADDRESS to EsteeEatz@gmail.com. This promotion will end SUNDAY, APRIL 3, 2016 at 11:59 AM (CST). No purchase necessary. Only U.S. residents over age 18 are eligible to participate. Winner will be chosen randomly and contacted via email. EsteeEatz.com and promotional partners are not responsible for lost, stolen, or misdirected mail. Giveaway provided by Houston Press. 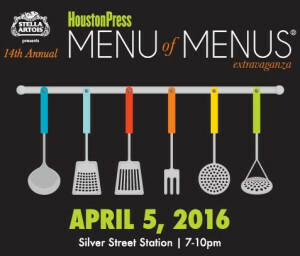 Houston Press is excited to host the 14th Annual Menu of Menus® Extravaganza presented by Stella Artois on Tuesday, April 5, 2016 from 7PM-10PM at 1501 Silver Street. The Menu of Menus® Extravaganza presented by Stella Artois is one of Houston’s largest food & wine events featuring over 40 area restaurants alongside wine, beer and cocktail sampling. The event will also feature the 5th Annual Iron Fork Chef Competition will showcase two of Houston’s most popular up and coming chefs as they face off in a head-to-head cooking competition that will be judged by local area celebrities. The winning chef will receive the “Iron Fork” award and bragging rights for the next year! During the exciting cooking competition, guests will enjoy cocktails, wine and food sampling from a number of the city’s best restaurants. VIP Admission: Ticket includes entry into the event 1 hour earlier than general admission (entry at 6pm). Included in the price is food, wine, liquor/beer sampling, entertainment, PLUS complimentary valet (until 6:30pm only).